Variety and originality is what drew me to anime in the first place. There’s that initial sense of discovery when you find a new entertainment medium that is unlike anything you’ve seen before. 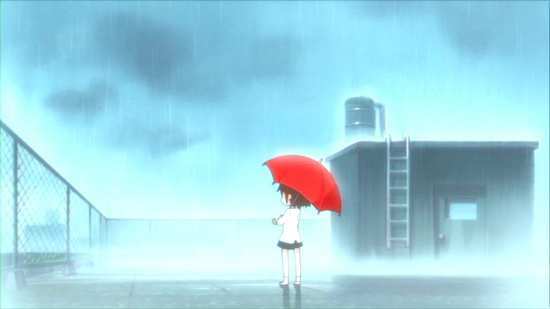 But if you’ve become ingrained to the Western way of doing things, the commonalities and clichés in UK and Hollywood entertainment, then the sheer cornucopia of story ideas and genres that are represented in anime comes as a breath of fresh air. After a while you do learn that anime too has its clichés and commonalities, but I still look to anime for things I’ve never seen before, stories that are new, risks and chances taken by directors and creators that aren’t necessarily beholden to a lowest common denominator mass audience. But sometimes I just want to forget all that and have a laugh. Fortunately anime does out and out comedy too, and takes a leaf from Japan’s Manzai comedy routines, the enthusiastic idiot and violent straight man set-up that itself is derived from Western Laurel and Hardy, and Abbot and Costello type acts. Of course this being anime, the set-up can be a little stranger than real life would tend to offer. 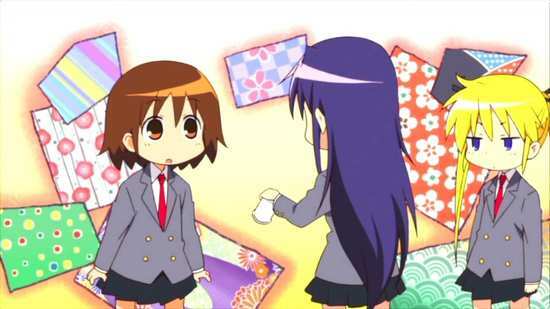 Yasuna Oribe is a high school student, probably. She’s friendly, outgoing and enthusiastic, particularly for her classmate Sonia. They’d be the best of friends, only Sonia is an assassin, and tends to react to Yasuna’s enthusiasm with almost lethal violence. 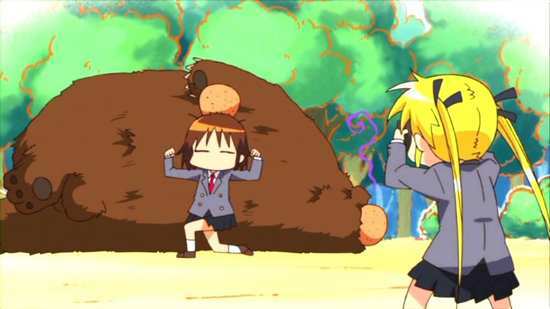 A pat on the shoulder results in a broken hand, anything more effusive gets Yasuna caught in a headlock. 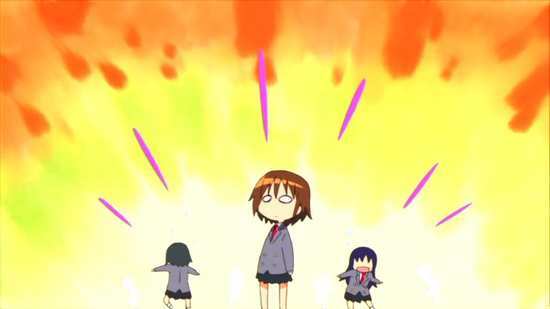 But Sonia’s lightning quick reflexes don’t keep Yasuna down for long. Also attending their school is Agiri Goshiki, an unlikely ninja, while from outside the school an Unused Character plots against Sonia. 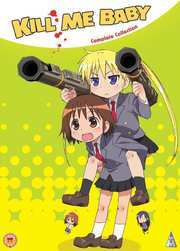 13 Episodes of Kill Me Baby are presented across 3 DVDs from MVM. The show is also out on Blu-ray on the same day. You have the choice between DD 2.0 English and Japanese stereo with optional translated subtitles and a signs only track. 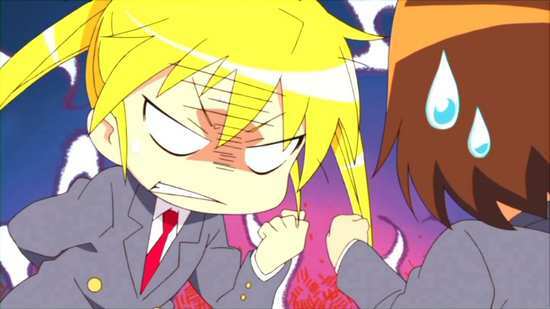 I gave the English dub 5 minutes and had to quit after just two. It’s so bad that you need the subtitles on as some of the voices are incomprehensible. The original Japanese audio is the way to go here, especially as Yasuna’s voice actress creates an adorable character, getting the balance between manic and meek just right. 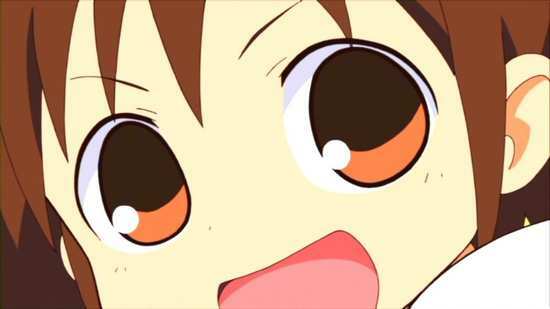 Hearing a contrite Yasuna after she’s been chastised by Sonia makes the hyperactive Yasuna even funnier. The opening theme just doesn’t end, but it’s balanced by a really nice electronica ending, while the incidental themes suit the comedy well. One problem in episode 12 at 4:19 is a subtitle that shows up too late, at the end of the sentence, and doesn’t stay on screen long enough to read, but other than that, the subtitles are timed accurately and free of typographical error. The discs present their content with static menus and jacket pictures. Each episode is followed by a translated English credit reel. Disc 1 offers trailers for further Sentai product, Humanity Has Declined, TARI TARI, Special A, Kampfer – fur de liebe, Natsuyuki Rendezvous, and Okamikamushi – Masque of the Wolf. Disc 2 has the textless credits and surprisingly the opening credits are the usual 90 seconds. They feel twice as long. Comedy tends to get brushed by when it comes to critical and audience acclaim. It seems that things that make us laugh, never feel as important as things that thrill us, or scare us, or move our more tender emotions. You don’t see too many comedies win Oscars. I’m guilty of the same thing too, forgetting the shows and films that moved me to laugh, in favour of other genres when it comes to picking my favourites. I think there is a perception that there is something cheap and facile in invoking laughter, rather than evoking other emotions. Pure nonsense of course, as laughter may be one of the most social, and healthy activities that a person can partake of. If there is a best comedy anime award somewhere, Kill Me Baby will be a likely contender, as it’s the funniest anime I have seen in quite a while. I was actually laughing out loud, repeatedly during episodes, not the odd smirk, or knowing chuckle that I usually save for anime humour. These were actually belly laughs! Not that Kill Me Baby is perfect, far from it. It’s based on a short form manga, a lot like the Peanuts comic strips in that you’d get just a few panels to set-up and deliver a punchline. The typical episode of Kill Me Baby has three or five arcs to it, each one of them focussing on a particular subject, and delivering gag after gag. It can be hit or miss, with some jokes falling flat, while others hit like a humorous hurricane. I’d say the hit rate is around 30-70 for me. It’s just that the jokes are so densely packed, that even the 30 have me laughing all the way through an episode. It’s rare that I actually stop. Of course humour is in the eye of the beholder, and what works for some won’t work for all. Kill Me Baby is essentially a Manzai routine, the Japanese extrapolation of the classic comedy double act, with an enthusiastic idiot partnered with a straight man, who responds to the idiot’s lunacy with varying degrees of violence. 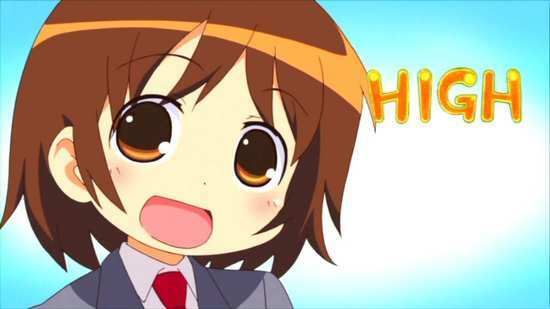 Yasuna Oribe is the enthusiastic idiot, (probably) a high school girl with a joie de vivre that can quickly grate. She says she’s probably a high school girl, as her interests and passions tend to the more juvenile, and elementary school level. The straight man in this show is Sonia, the assassin who sits next to her in class. 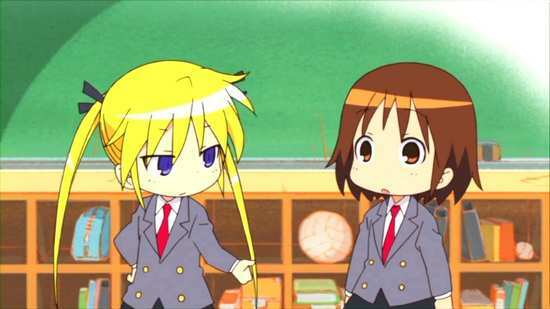 Yasuna wants to be Sonia’s friend, Sonia finds Yasuna annoying, but the violence is pre-built into the premise when Sonia’s instincts kick in merely at Yasuna’s greeting. 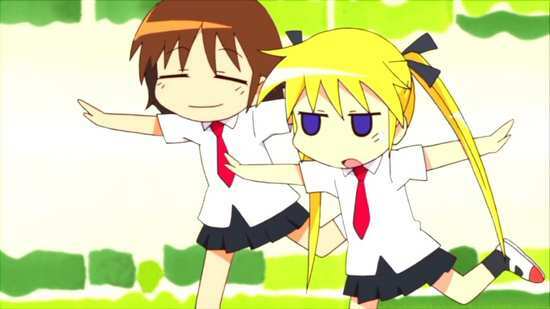 A tap on the shoulder results in a broken hand, and an attempt at a hug winds up with Yasuna in a headlock. Fortunately she’s a quick healer. So the average set-up to a gag is that Yasuna will unveil to Sonia her latest interest or passion, or topic of conversation. 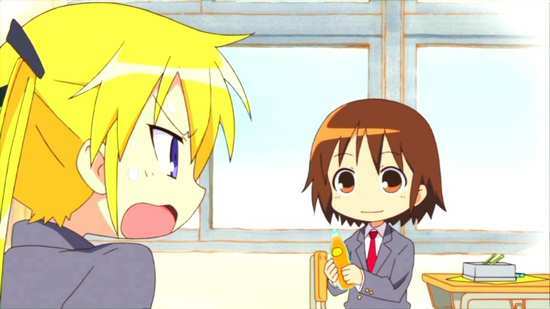 Despite her disdain, Sonia will be drawn in, and even show some interest, only for Yasuna to top it off with a moment of idiocy, at which point violence will ensue as Sonia’s frustrations overwhelm. Doesn’t sound too funny when I type it out, but it’s in the execution that Kill Me Baby works, the nature of the gags, and the timing. Just to add to the mix, there’s also the character of Agiri Goshiki, a self-styled ninja, but whose abilities tend more to sleight of hand and illusion. She’s a light, airy girl whose professionalism appeals to Sonia, but whose ditziness resonates with Yasuna, so on occasion the duo becomes a trio for even more humorous possibilities. The temptation in a review like this is to list all the funny bits in the show, but they’re never as funny written down, will effectively spoil the show, make the review longer, and wind up with me spending five hours more writing this thing, as I recall a funny moment, and sit here for a minute, chuckling to myself before getting around to typing it out. 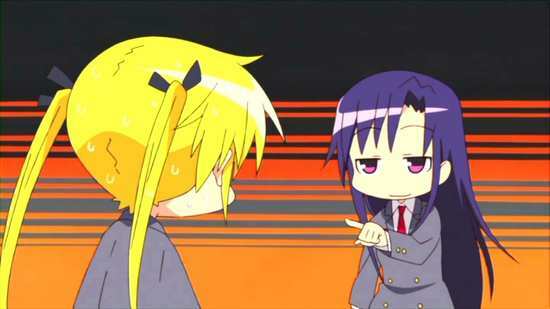 So you’ll just have to take my word that Kill Me Baby is one of the funniest anime comedies I have seen. I did think at first that the short gag format wouldn’t hold over 25 minute episodes, that the show would work better in a 10 minute format or even shorter, but the laughs do sustain. 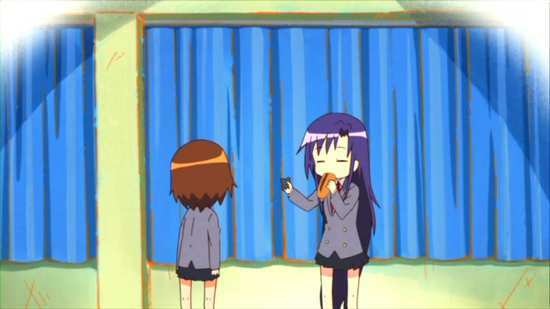 And there is something of a storyline and character development, even in this gag based show, with Yasuna slowly becoming determined to reform her assassin friend, and Sonia slowly developing a tolerance, if not more for her desk neighbour. There are moments in the final two episodes that are even quite touching, although the lasting image I have is of Sonia desperately trying to blow out the sticks of dynamite that Agiri has used instead of candles on her birthday cake. Kill Me Baby is my kind of silly. It’s fast paced, funny, and with a trio of charming characters. It gets the straight-man/idiot routine down perfectly in terms of timing and impact, and I love comedies that actually make me laugh instead of just smirk or chuckle. This is going straight onto the re-watch pile!